In recent years, the AFL has introduced a number of "themed" rounds each season. Rivalry, Grassroots and Heritage rounds each focussed on one particular aspect of football and gave it due recognition. Following their success, the AFL has introduced other complimentary rounds that have further played upon notions of "giving back" or "getting involved". One of the newly introduced themes this season was "Welcome to the AFL". 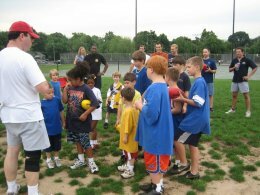 On Saturday July 8th, the Baltimore Washington Eagles hosted its first USFooty Kids/Auskick clinic in Arlington, VA. I ran the clinic with the help of Denis Ryan (USFooty Kids National Coordinator) and members of the Baltimore Washington Eagles including Club President Rob Brunton and Senior Coach Matty Bishop. We had about 15 boys and girls aged 6 to 12. This was the first of two clinics for the year, with the second clinic on July 22nd. For the second year running English schools have fielded Australian Football teams in the London Youth Games, with the Carshalton team scoring a narrow win over Hackney's side this year. Hopefully the high profile event will help boost interest in footy amongst children in the UK. It's been a rocky road for Denmark's national team over the past five years - from an international glamour side to a surprise withdrawal from the International Cup. A new coach is on the case and a new era beckons. AFL South Africa's program to send visiting Australian tourists into the townships to teach Australian Football was a great chance to personally experience the country in a way rarely available but with at times surprising similarities to home. Currently, the AFL is considering development pathways for international talent (see Part Two of Kevin Sheehan Interview). While this should be encouraged, I hope the AFL will consider the cultural differences between countries. In particular, any pathway for U.S. players into the AFL must go through the U.S. college system. A pathway that does not allow U.S. players to go to college will be a road to nowhere. Irishman Colm Begley was today elevated from the Brisbane Lions rookie list to its senior list. Brisbane has suffered a large number of injuries this season, and the injury to Justin Leppitsch and his subsequent retirement has created a vacancy on the senior list. Begley, who was recruited from Gaelic football, only came to Australian Rules football in December. He has quickly adapted to the game, given a start in the Lions team in the NAB cup preseason competition where he did not look out of place. We also briefly review the other Irishmen of the AFL, and Englishman Brad Moran. Since the 2005 International Cup the Australian Football League has conducted an extensive review of how it approaches international development of the game. This has resulted in the appointment of a new high powered International Development Committee and five contact points within the AFL for the nominal five regions of Africa, America, Oceania, Asia and Europe. Other major revelations include confirmation of Melbourne as the likely 2008 International Cup venue, with a four year cycle thereafter, and hopes that the cost of attendance can be significantly offset. Alexander Fangavaka, aged 14, is the second young Tongan lad to gain a TAFA (Tongan Australian Football Association) footy scholarship to Australia and the first to be based in Adelaide, where he is studying and playing at Norwood-Morialta High School, which has a strong history of football. He's also playing club football for Hectorville "Heccies" under-15's in the South Australian Amateur Football League and has attracted plenty of media attention.